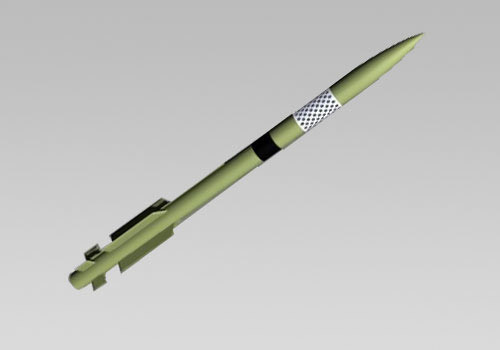 The PAC-3 (Patriot Advanced Capability 3) missile is the ATBM (Anti Theater Ballistic Missile) component of the U.S. Army's Patriot air defense system, and will complement the existing MIM-104 Patriot missiles. This kit is a scale 2.6" diameter 4 fin mid-power rocket. It includes a pre-slotted body tube, plastic nose cone, 8 laser-cut 1/8" plywood fins, 29mm 8" cardboard motor tube, plywood centering rings, a Nomex chute protector, a Kevlar/Nylon shock cord, eyebolt and washers, 1/4" launch lugs, vinyl decal and a 24" nylon parachute. All tubes are heavy-duty cardboard. CG: 31" from the nose tip.